I wanted to mount the Pi vertically to show off the intricately beautiful circuit board (and possibly to take up less space, but this thing is tiny!) and I’ve used window bricks that line up with the Pi logo. For my first attempts I tried designing a case using the lego designer – but beware, many of the bricks aren’t available from the pick-a-brick store. I’ve had to use 1×1 tiles stacked in groups of 3 to make the corners, and 2×1 tiles for the top. This case is 4 bricks wide as the GPIO pins stick out slightly too far to fit with 2 bricks wide. Windows and arch bricks form the holes for the various plugs, with the USB and Ethernet cables emerging from the top. I’ve used the mini USB power supply from Amazon Kindle combined with a remote controlled socket for power. The latest version has the coloured bricks at the bottom, and more clear bricks at the top to refract the light from the various power / activity indicators. It also stands a little bit taller to allow for the USB mini power plug and a grip to hold the Pi motherboard in place. I’ve coloured the bricks on the model above since they were easier to see than transparent bricks. Inside the case there’s a little c-shaped hook that the Raspberry Pi sits in. I was able to find all the bricks with the colour-scheme as used in the transparent version of the model in the pick-a-brick store. Download the lego designer files. 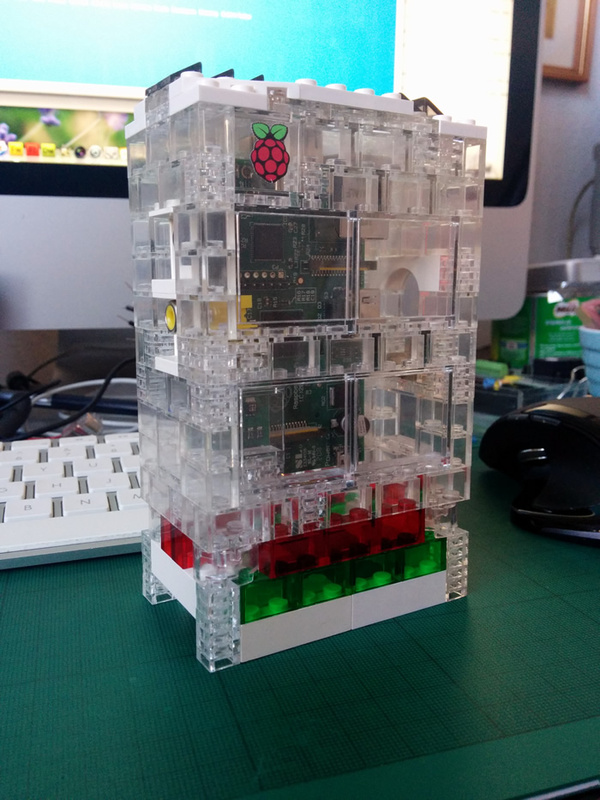 If you’re building this, you need a Pi to hand to check the alignment of the ports – I have fully tested this with a Pi, but you need to build the Lego around it or it’ll get a bit fiddly.